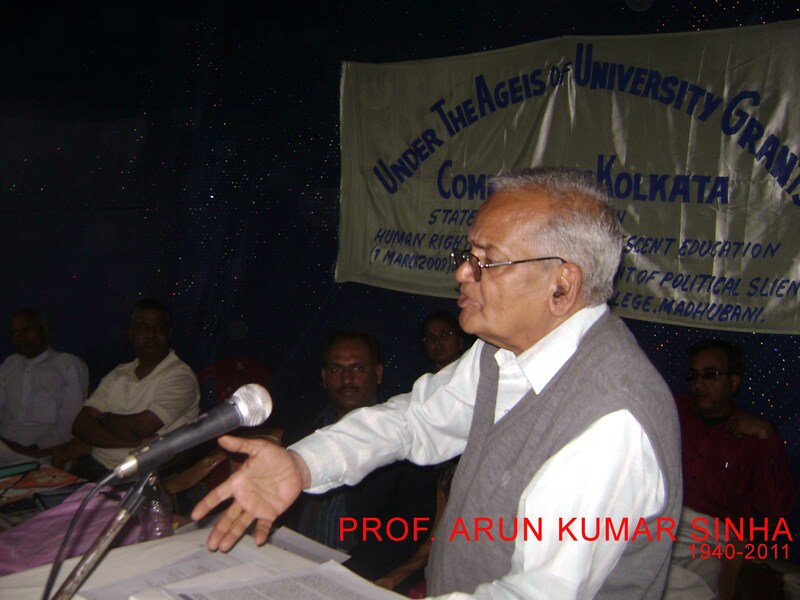 Arun Kumar Sinha (27 August 1940-28 November 2011) was Professor in English at Langat Singh College (established in 1899), B R A Bihar University, Muzaffarpur, Bihar, India, from where he retired as its Principal in the year 2000. An acclaimed social activist, one of the important pillars of Teachers’ Movement, especially in North Bihar, and a committed teacher, he is known for his work on T S Eliot and Mark Twain, on the one hand, and his role and contribution to the Socialist and Sarvodaya Movement, on the other. He was also Convener, State Intellectual Cell of Bharatiya Lok Dal, Bihar and a Member of its State Executive in 1980s, which was led by Chowdhary Charan Singh, a former Prime Minister of India, at the national level. Prof. Sinha was the elected President of L S College Teachers’ Association for four times in the 1980s and 1990s and was twice elected General Secretary of the Combined Teachers’ Association of L.S. College and Bihar University PG Departments’ College and University Teachers in the early 1980s. In the 1980s and 1990s he served as the Chief Editor of the L S College Magazine ‘Vaishali’. He is fondly remembered as AKS–the initials of his name–by his students. The PROF. ARUN KUMAR SINHA CENTRE FOR LITERARY AND SOCIAL UNDERSTANDING is an initiative of the students, associates and family-members of Prof. Sinha to explore the multi-dimensional aspects of his personality and work, and will also provide a platform to discuss the literary and social issues that were so very dear to Prof. Sinha.